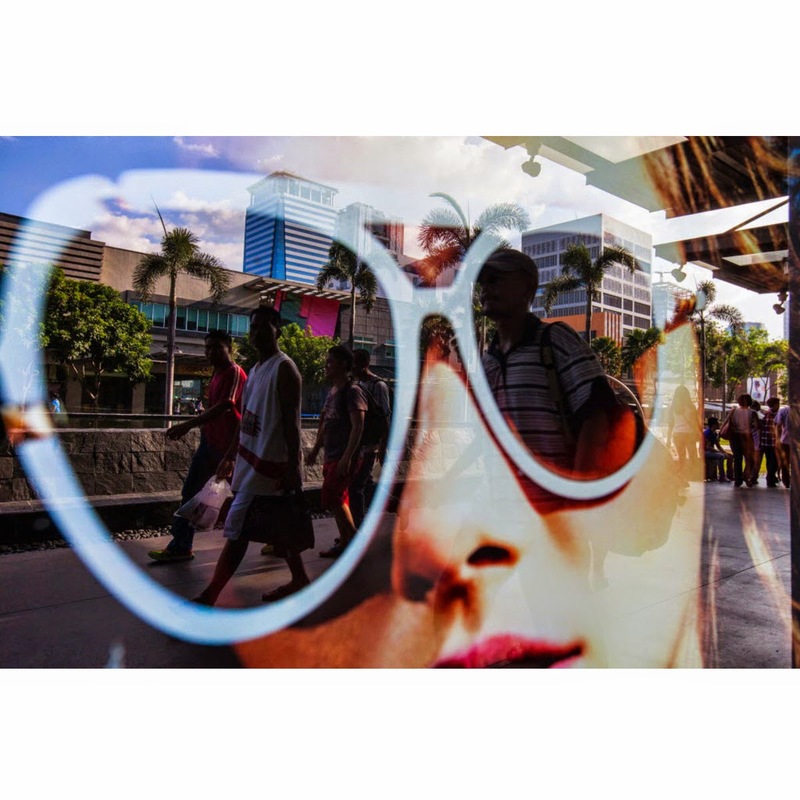 Pedestrians are reflected in a store window display in the Fort Bonifacio district of Manila, the Philippines. The Philippines is no longer the `sick man of Asia', Economic Planning Secretary Arsenio Balisacan declared yesterday after the economy grew a better-than-estimated 6.9 percent last quarter from a year earlier. That capped three successive years of above-6-percent growth, placing it well ahead of Thailand, once a growth engine of Southeast Asia. 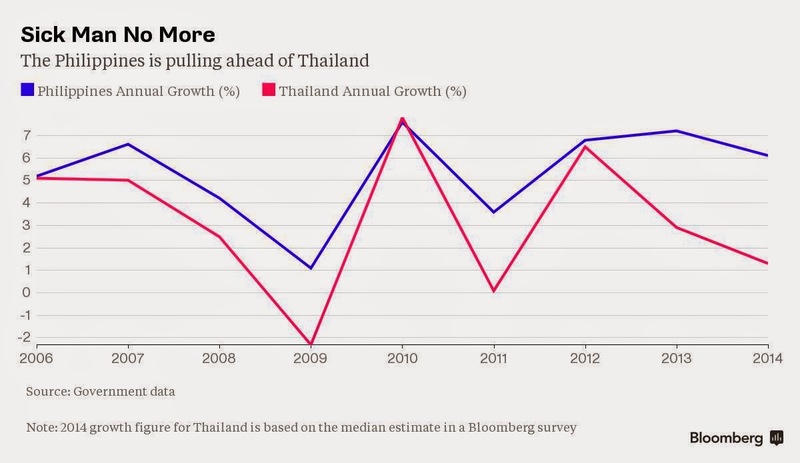 GDP Growth: While both countries recorded almost-similar growth rates in 2006, the Thai economy has since floundered because of military coups, floods and persistent political uncertainty. The Philippines, on the other hand, has expanded steadily, with President Benigno Aquino's efforts to crack down on corruption and improve the investment climate from the time he took office in 2010 bearing fruit. Manufacturing Boom: With rising foreign investment flows, Philippine manufacturing is on the uptick, while Thailand's manufacturing prowess has taken a hit in recent years from the record floods of 2011, smaller R&D investments compared to regional rivals and obsolete technology, particularly in electronics, the Bank of Thailand has said. Thailand’s ranking for innovation in the World Economic Forum’s Global Competitiveness Index fell to 67 in 2014 from 33 in 2007, while the Philippines climbed. Exports Surge: Philippine exports of items including electronics and apparel have been climbing, with shipments rising about 12 percent last year. 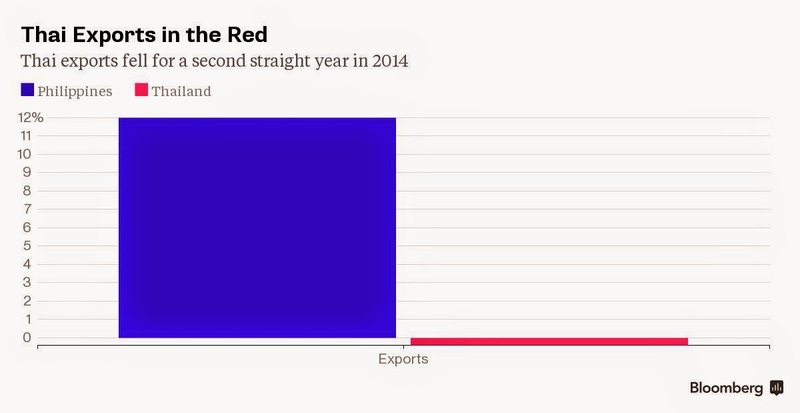 In contrast, Thailand's exports fell last year for a second straight year, the first time that has happened in at least two decades, as investors look to diversify to cheaper, more politically stable alternatives from Vietnam to Indonesia. 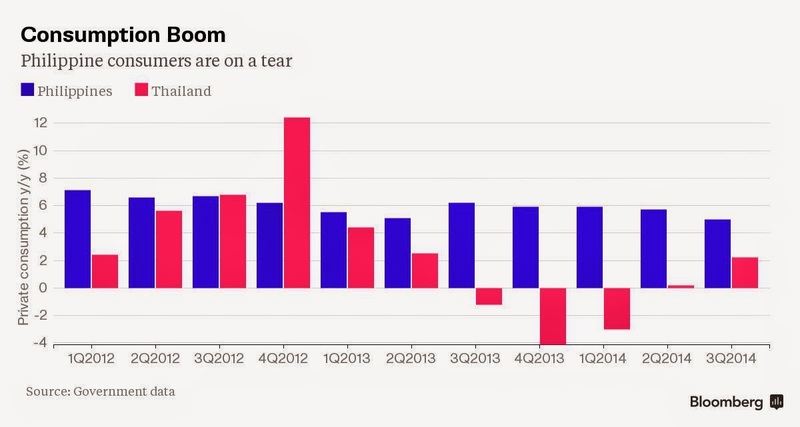 Consumption Swell. Rising remittances and wages are fueling domestic consumption in the Philippines, helping counter the uneven global recovery. 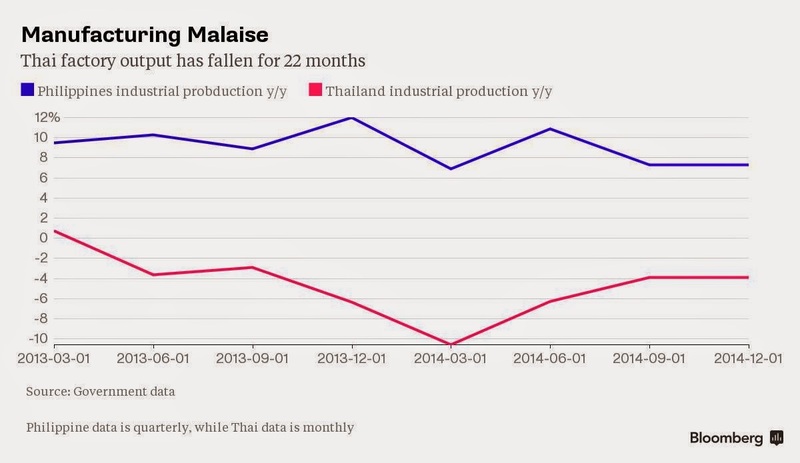 In Thailand, on the other hand, slower government spending and lingering political uncertainty has crimped private consumption. Demographic Dividend. About 31 percent of the Philippine population was 10-24 years old last year, compared with 20 percent in Thailand, according to the United Nations Population Fund. The average fertility rate in the Philippines from 2010-2015 is estimated at 3.1 percent compared with Thailand's 1.4 percent. 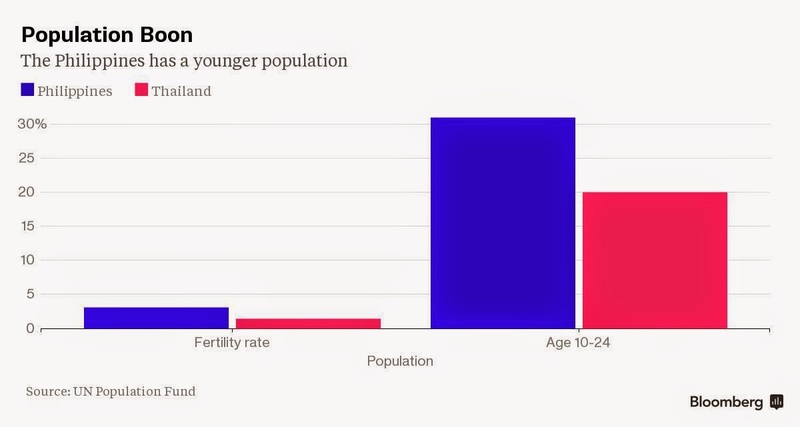 Little wonder then that Thailand is seeing the most rapid reduction in the ranks of its working-age population in Southeast Asia.